If you are like me and you want to have your chocolate and eat it too, this is the recipe for you. It’s super chocolatey, easy to make, gluten, sugar and lactose free, and will absolutely impress. 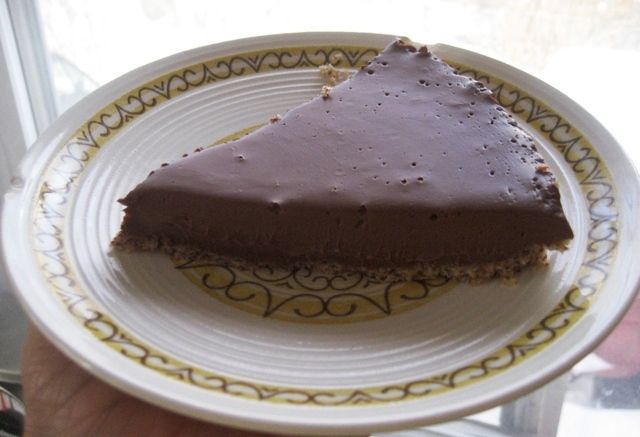 What’s more thoughtful and delicious than a homemade chocolate tart? If you want to get really awesome you can infuse the chocolate with lavender, woah. I got this recipe from my husband Dana, all I changed was the crust. 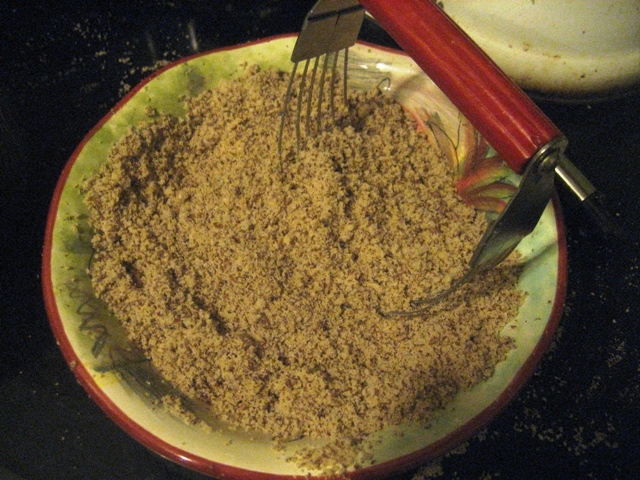 Combine all the ingredients, a food processor or blender will do the trick as will a pastry cutter or fork, to make a crumbly, uniform mixture. Press evenly into a 9 inch spring form pan, bank the edges and bake at 350 for about 10 minutes. Take it out and let it cool while you make the filling. If your pan is a little smaller you will have more crust on the edges, yum, if it’s a bigger pan, just make a little more of the crust keeping the ratio of 2 cups dry to ¼ cup fat. Looks the same before and after baking except for a little bit of browning on the edges. 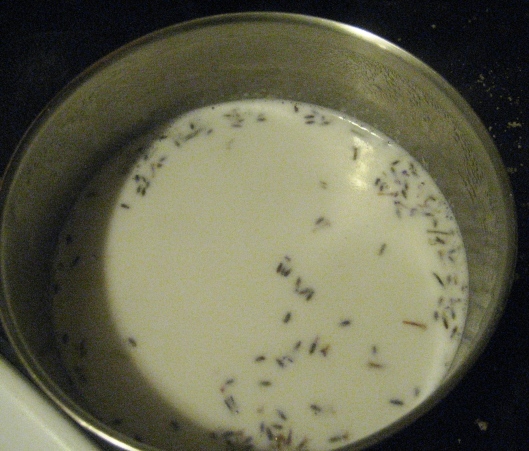 ¼-1/2 teaspoon dry lavender, this is optional, but recommended for awesomeness and unexpected depth of flavor. How strong and fragrant the the lavender you are using will determine how much you add in. 7 oz of the best bittersweet chocolate you can find. You can also use a semi sweet dark chocolate, just make sure it’s low in sugar, if that’s something you need to watch. 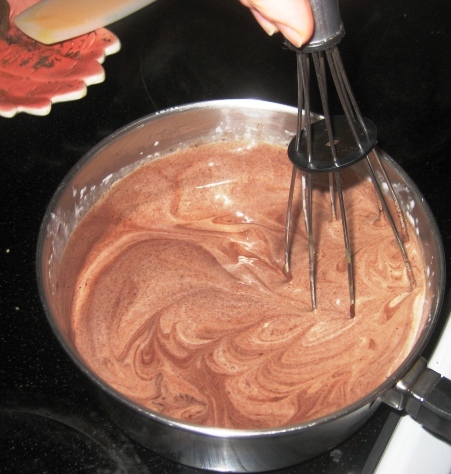 Whisk the chopped bittersweet chocolate into the warm coconut milk until melted. Make sure it’s well combined then set it aside and get cracking with your eggs. Separate the yolks from 4 eggs. Save the whites to make macaroons, yum! Whisk the yolks and sugar or stevia together gently until combined. Use a bowl big enough to accommodate the chocolate coconut mixture. The chocolate coconut mixture should be about body temperature, go ahead, use your finger to check and double check; you don’t want to cook the eggs too fast. Dana pours while I whisk and Lizzy takes pictures, go team! 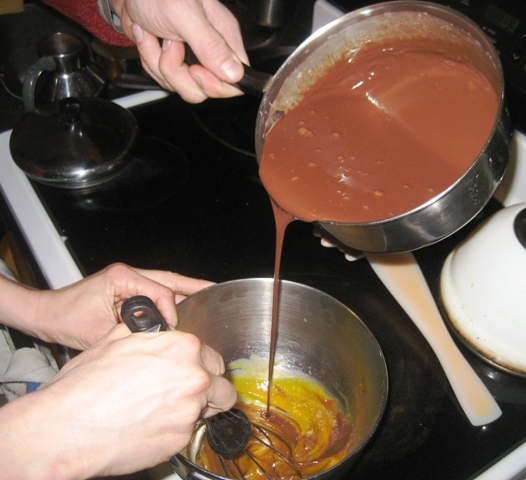 Slowly pour the chocolate mixture into the yolks and sugar, whisking the yolks all the while. It’s helpful to get someone to pour the chocolate mixture while you whisk the yolks, this makes for less mess and a better incorporated tart filling. When everything is in one bowl and well combined, pour your finished tart filling into your prepared crust and refrigerate for one hour. Serve at room temperature and enjoy! Chocolate lavender tart with almond crust, keeps well in the fridge but ours usually gets eaten with in 24 hours! Previous Spaghetti Squash with Walnut Miso Topping Next The Exciting Conclusion to Hard Cider Homebrew! Oh yes, my birthday is a few days after Valentine’s Day and this is my favorite birthday treat! Have fun and post a picture if you want to, I would love to see what your version looks like! This was yummy! I used 1/2 tsp lavender but didn’t taste it at all (it was kind of old so maybe could have used more). 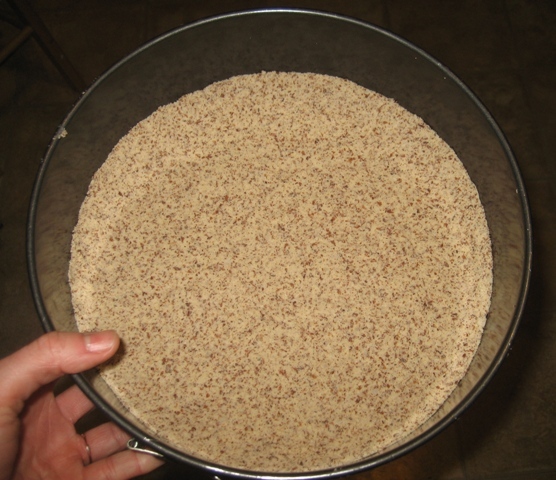 For the crust I did half ground hazelnut (left over from making nut milk) and half ground unsweetened coconut. I may have used a bit of extra chocolate (wow was it rich! and caffeinated!) and used around 1 Tbs stevia. Took about 2 hours to set up in my fridge. Delish! Thanks for all the great recipes. Thank you for the feedback! The lavender can be a bit tricky if it’s older. 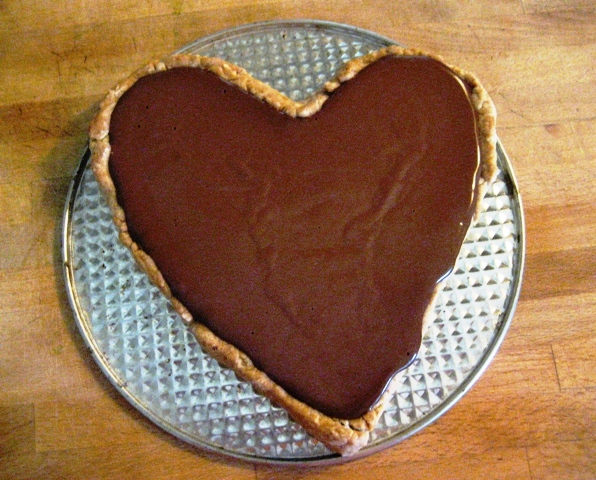 I like the idea of using hazelnuts in the crust, sort of a Nutella flavor, yum!